RATE PER PC - RS 9 ONWARDS. 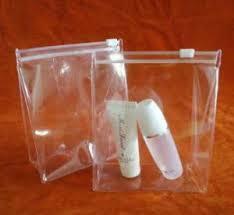 We are leading manufacturer of Pvc Zip lock Bags / Pouch . Pvc Zip lock Bags are used to make packing attractive. Pvc zip lock bags can be used by N customer for N times for personal use.You can print your Brand name on Zip lock Pouch and keep you brand to advertise in N number of hands which will increase your product and brand value. Looking for PVC ZIP POUCH ?